Layers of history characterise this unique site, connecting deeply to the medieval culture of London. 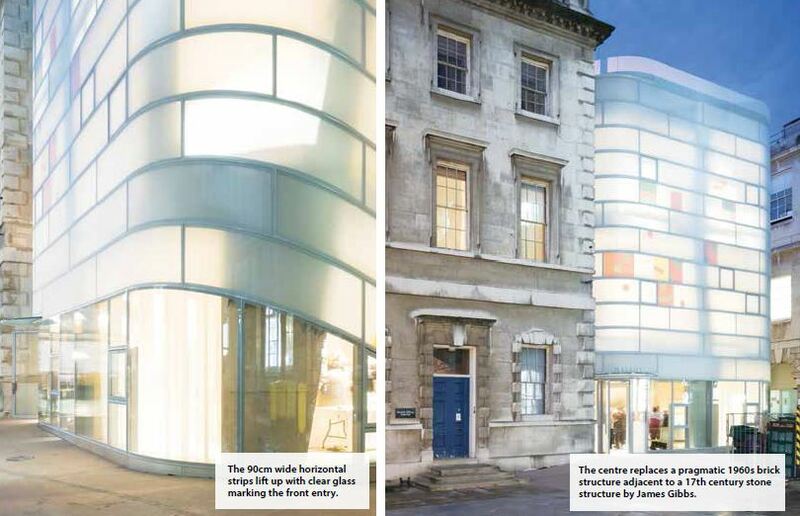 The centre replaces a pragmatic 1960s brick structure and architect Steven Holl carefully considered the best way to respect the adjacent 17th century stone structure by James Gibbs, not by trying to match it, but by providing an authentic piece as complimentary contrast. In fact, the new building is curved at the corners to expose the original finishes on the end of the James Gibbs building. 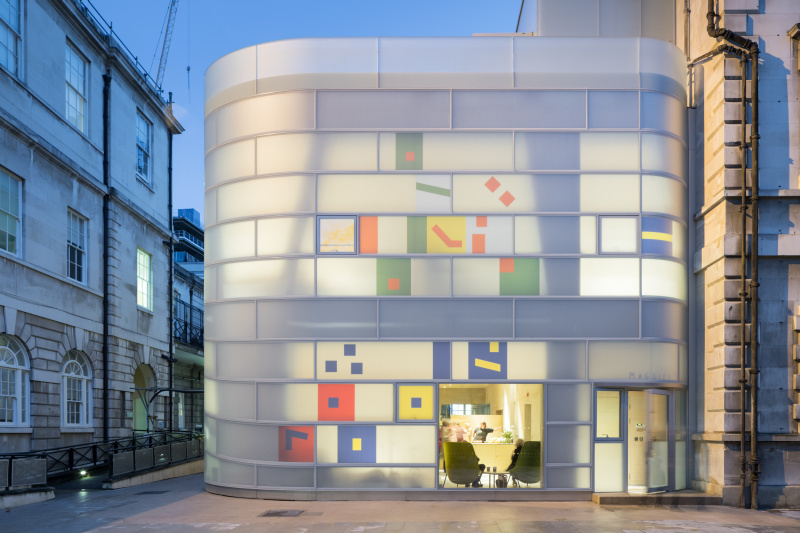 For the facade, a new type of polychrome insulating glass was specifically developed by Steven Holl Architects and glass manufacturer Okalux. Not wanting a typical glass facade, their aim was to create a cladding material that is unlike anything else. The matt white, alabaster-like facade features various colour fields that are embedded in-between the inner and outer glass, floating like a musical notation on the stack bar lines that wrap the building surface. This design was inspired by the neume notation of medieval music of the 13th century, recalling some of the history that characterises the site. The word “neume” originates from the Greek “pnevma”, which means vital force or breath of life. The outer glass layer is organised in horizontal bands like a musical stave, while the internal concrete structure branches like a hand. The 90cm wide horizontal strips follow the geometry of the main stair along the north facade, while lifting up with clear glass marking the front entry. 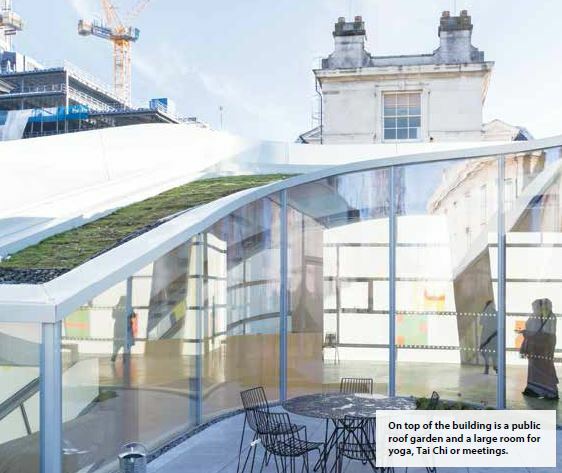 A second entry on the western side opens onto the extended garden of the adjacent church and on top of the building, a peaceful roof garden houses a large room for yoga, Tai Chi or meetings. 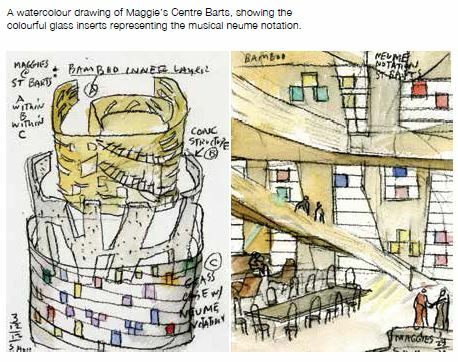 The three-storey building was envisioned as a “vessel within a vessel within a vessel” – a simple building, but with different experiences, according to Holl. From the outside, the matt glass with a wash of colour encourages a feel of calm. When entering the building, the perforated bamboo adds warmth and an open, curved staircase gently ascends upwards. The colour washes on the floor and the play of light from the musical neume notation analogy presents a joyful, glowing and uplifting ambience to patients and visitors alike. Full thanks and acknowledgement are given to Steven Holl Architects for the information given to write this article.